economics and technical viability are highly encouraging, highlighting its potential to become a low cost/high margin flake graphite producer. Life of mine operating cost estimate of US$498 per tonne of concentrate (including transport costs FOB Nacala Port) mean excellent operating margins. Initial capital investment of US$112m (before contingency) with a 1.7 year payback. Very low life of mine strip ratio of 0.67:1.00 waste:ore. Excellent supply / demand outlook for Duwi type concentrate supported by a large proportion of Extra Large (‘jumbo’) flake. Concentrate flake size and purity ‘footprint’ indicates suitability for use in a wide range of traditional and emerging end-use applications. Significant infrastructure advantages including proximity to existing rail, grid power, labour and fresh water supplies. 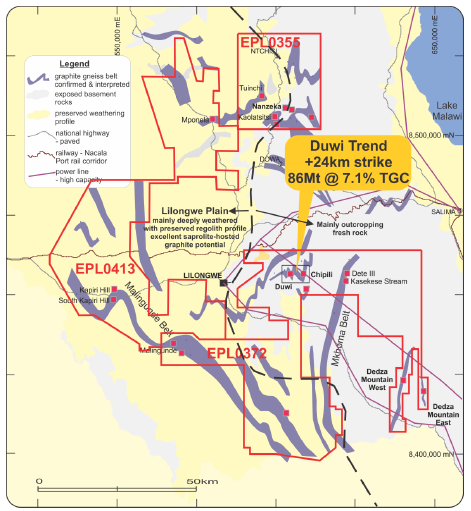 Large resource (6th largest globally) and very substantial further exploration upside confirms Duwi as a potential multi-generational supplier of flake graphite. Jumbo flake concentrates grading up to 99.2% C(t) with combined coarse and jumbo flake categories (+150μm) averaging 97.5% C(t). Combined concentrates across all flake size fractions grading up to 96.6% C(t). 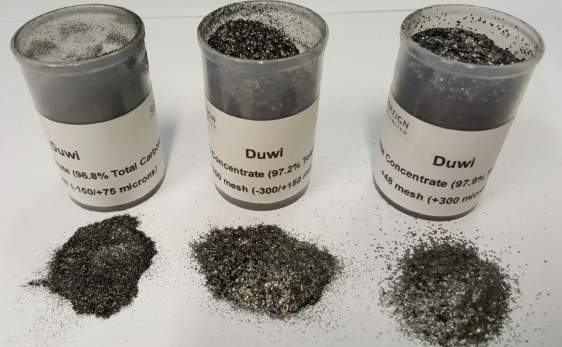 Very high grades with very low impurities indicate that Duwi flake graphite products may be suitable for producing spherical graphite for u se in emerging lithium-ion battery technologies. Separate independent laboratory test-work will test suitability for spherical graphite characteristics of Duwi flake graphite. The range of test-work undertaken to date demonstrates that the Duwi Flake Graphite Project has a high degree of flexibility to produce flake products for a wide range of applications. Additional samples of bulk flotation concentrates have been distributed to potential customers and end users for initial downstream application property testing/characterisation. Sovereign Metals has so far identified 50 targets including six prime, large, high-grade, flake graphite targets: five within EPL0372 (referred to as the Duwi Trend) and the Nanzeka Prospect within EPL0355. 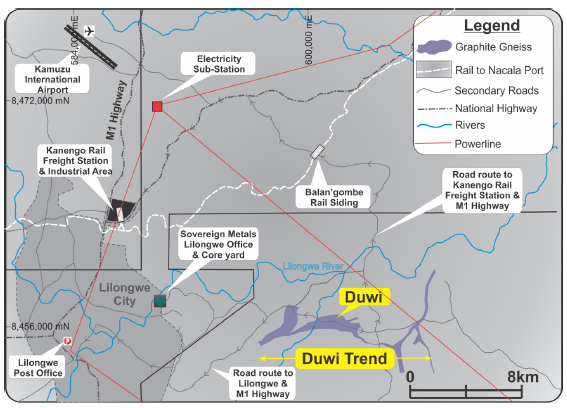 The Central Malawi Graphite Project has the benefit of being surrounded by established infrastructure including high capacity power lines, rail, roads and a port which is currently undergoing a major expansion. This is crucial at a time where there is a energy deficit in Malawi, which has adversely affected mining operations in the country.